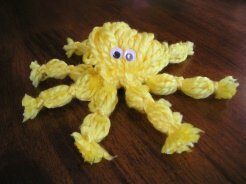 This adorable Yarn Octopus is a great Ocean animal craft for kids, it's also a great way for children to practice tying knots! 1. Make lengths of yarn about 12" long. You need to have quite a few pieces of yarn, at least 24, but more pieces makes a bigger octopus. 2. fold your yarn in half and tie a separate peice of yarn around the top - this will make your octopus' head. 3. Separate your yarn into eight even sections. 4. With separate pieces of yarn you will need to tie three knots on each arm. One at the top, near the head; one in the middle, and one at the end of the arm. Trim off any uneven yarn at the ends. 5. If you're not tired from tying all those knots, glue on your googly eyes, and you're done!